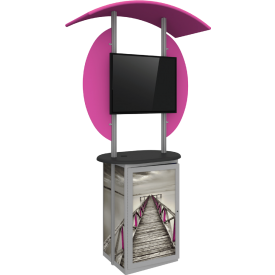 Whether you are displaying products in a showroom, looping videos of your store or portfolio at a trade show or displaying a welcome message in your lobby, modular kiosk displays convey media with style. 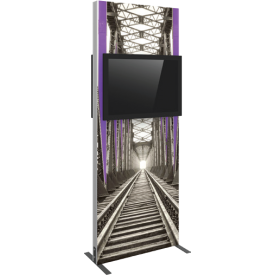 With numerous unique styles to choose from, these kiosks are designed to display media with elegance. 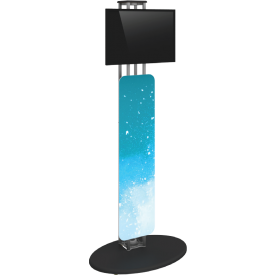 Kiosk displays couple sturdy, modular aluminum hardware with rigid graphic panels or printed fabric graphics, while remaining durable and portable. Kiosks durably and easily display multi-media messaging, and added counters and fabric or rigid graphics make it easy to add literature or branding to accompany. Tabletops and monitor mounts add additional functionality with a custom look and flare. Counter tops are available in four thermoform laminate finishes for versatility. Browse the wide range of modular kiosks available to find the one that is right for your needs!